We’re almost there. Hey, who spilled the milkshake in the backseat?! Sadly, you and I are nearing the end of our cross-country trek through the heart of America on Route 66. We’ve visited mountains and canyons and seen the stars shine brighter than we’d ever thought they could. We’ve eaten things that kept us up all night with explosive diarrhea. When we see our next sunset, it will be from the Santa Monica pier, where the road ends at the Pacific Ocean. Because Route 66 is now an unofficial and decommissioned road, many towns have been bypassed by the Interstate Highway System. Before the interstate, Route 66 (and hundreds of other roads like it) ran right through the middle of town. On my trip, I traveled through hundreds of small towns that had one traffic light. Frequently, when you enter these places, you do so on their main street, and most of these places can’t be reached directly from the Interstate. You have to get off at an exit and drive for a while to find them. And in these small towns, one of the most interesting things about my trip on Route 66 was that not a single day went by that I didn’t see or hear at least one reference to the Pixar film Cars. Not one, or even a few towns, but MOST of them seemed to have the movie Cars on their lips and in their hearts. It quickly became the norm to roll into a town with a population of 500 people and see a battered old truck or car from the 1950s at the corner gas station with a pair of big eyes placed in the front windshield. 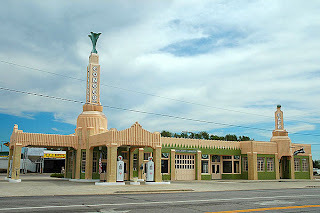 For many of these towns and people, the movie Cars was their one connection to the world that was passing them by at 70 miles per hour. Cars was the last Pixar movie that I actually watched; I held out for so long because I didn’t think I was going to like it even though the rest of my family had affection for it. I even saw Brave before I finally found the time and desire to sit down and watch Cars a few months ago. I didn’t think there was going to be much for me there, and I remember distinctly seeing all the trailers for the movie in theaters back in 2005 and 2006. I’d roll my eyes and lament the huge response that Larry the Cable Guy got as Tow Mater. I don’t find him funny and I don’t care for his brand of redneck humor or the fact that I now associate Prilosec OTC and severe heartburn with him. I thought Cars was going to be a glorified redneck romp, which is a little bit too close to home for me to enjoy as entertainment. So when I finally did overcome my biases and sat down to watch Cars, it was a revelation. I realized just how wrong I’d been. A little digging revealed that the original title of Cars was going to be Route 66, but was changed to avoid confusion with a '60s television series of that name that still has quite a following. The genesis of the movie came from a road trip that director John Lasseter took with his family in 2000. He saw so many interesting things on the forgotten road that he hired Route 66 expert and author Michael Wallis to take a Pixar crew on a couple of Route 66 road trips to see as much as they could and soak up as much of the road culture as possible. The story and message of Cars is practically a love letter to Route 66. It points out the down side of our high-speed society and the appeal of the road less traveled. It does this with nostalgia and a sanguine, but knowing, nod of respect to a time now almost forgotten. We’re in a hurry to get everywhere; by speeding to get from point A to point B, we’re missing the details in life that make it worth living. That’s the simple message of Cars. The real Route 66 is a reflection of this bittersweet way of life. One gets the impression that the movie Cars has breathed life and tourism into the old road and all the little towns that litter its thousands of miles, but one also gets the impression that it’s not a story with an entirely happy ending. Not yet, anyway. The relationship with these people and Cars is therefore complicated. Cars has been a gigantic success for Disney and Pixar, and it’s a perennial source of revenue for the House of Mouse. I’d argue that the success of Cars as a marketable property is only rivaled by Star Wars in terms of how ubiquitous it is. You can find Cars bed sheets, toy cars, pencils and pens, folders, notebooks, soap, trash cans, greeting cards, trading cards, playing cards….and the list goes on and on. Cars and its sequel stand to generate billions of dollars worldwide for Disney for decades to come. Yet so many of the images and the things that are seen or featured in the Pixar movie come from a real source found on Route 66. The 1960 VW bus named Fillmore is based on the artist Bob Waldmire, a man who spent years and years traveling the road back and forth. His art and contributions are everywhere. 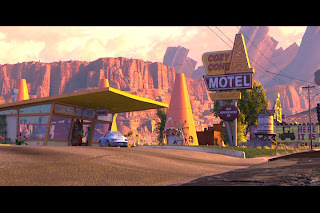 The Sheriff of Radiator Springs is voiced by Michael Wallis, the same author and Route 66 advocate who led the Pixar tour of the road in 2000. 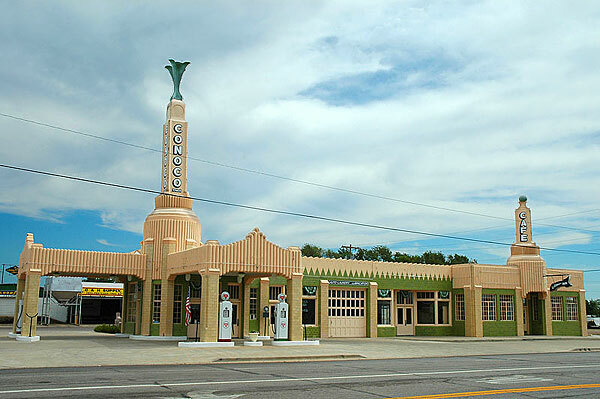 Entire buildings were replicated in the film, such as the Blue Swallow Motel and the Wig Wam Motel, which were combined into one location as Sally Carrera’s Cozy Cone Motel. Even the word Cozy is taken from the Cozy Dog Drive-In in Oklahoma, owned by Bob Waldmire’s family. Other entire buildings are recreated from real life and inserted into the movie. The Pixar crew literally used the history of Route 66 as the backdrop for their story, dropping entire historic locations into their animated family movie. And Tow Mater, the world’s most famous tow truck, is based on a rusted out old truck that the Pixar crew passed on a corner gas station in Galena, Kansas. The truck is still there (though now with eyes in the windshield for photo ops) and has become one of the major tourist attractions of Galena (population 3,085). One gets the impression that, while the proprietors of these historic landmarks are grateful to be included in the movie, there is perhaps more than a little resentment that they don’t share in those billions of revenue dollars that the merchandising of the movie provides Disney. That rusted out tow truck is now a worldwide icon, but that isn’t keeping the lights on in Galena. The real Route 66 is there in the small towns, but Disney and Pixar took it and packaged it, then sold it. 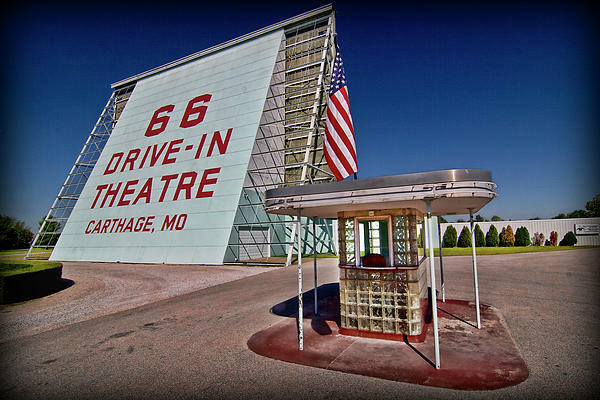 Still, Cars has raised awareness of the road like nothing else in the entire history of Route 66, and most of the people who live and work on or near its 2400 miles are grateful for the film. That’s why you can’t go very far without seeing someone paying respect to it or referencing it on the old road. The (very) modest tourism industry that they have mostly exists because of that one movie and they know it. In the end, Cars does a remarkable job of showing the spirit of this forgotten road and the mentality that led to it being the road less traveled. 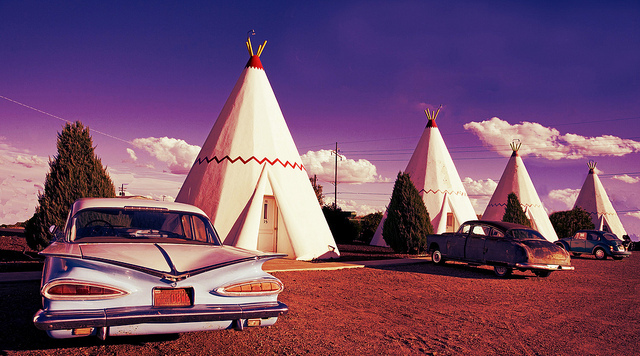 From the farm country of Illinois to the plains of Oklahoma, from the scenic landscapes of New Mexico to the deserts of Arizona, Route 66 is well represented in Cars. It was clearly a labor of love for all involved and it’s the largest contribution to Route 66 and the culture that surrounds the road. But look! While we’ve been talking about this, we’ve driven straight through the Mojave Desert and the outer limits of Los Angeles. We’re coming up on the Santa Monica Pier and the end of the road. It’s been quite a journey. We started with the dust covered, black and white landscapes and grim determination of The Grapes of Wrath. We drove straight on through the restless and empty dreams of a nation unfulfilled and searching for identity and meaning in Two-Lane Blacktop. And now we’ve driven the last leg of our journey through perhaps the most interesting and meaningful story of all in Cars, a movie that seems to exist solely to remind us to slow down, look around us, and savor the little things before they’re gone. And Route 66 does, in many places, feel almost gone. So this is it. We park and leave the car to walk on the pathway that runs along the cliffs above the Pacific Coast Highway. We see the pier ahead of us. There’s a ferris wheel, the smell of hamburgers and funnel cake, and a solitary road sign on the middle of the boardwalk that reads “Santa Monica 66: End of the Trail.” We’ve come a long way and this is the end. Despite all the miles we’ve driven across eight states, all the sights and smells, the people, the songs and the movies, the road has finally ended and we can go no further. We stand still, unsure what to do or where to go. Then we remember: the road goes on forever. We can drive it whenever we like. It’s always there, never really changing, never really going away. 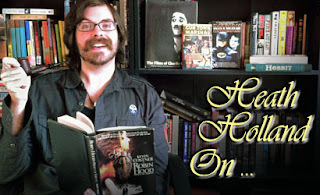 And even when we’re far away, the road is always right there on the DVD shelf. To visit Route 66, we need only push play. 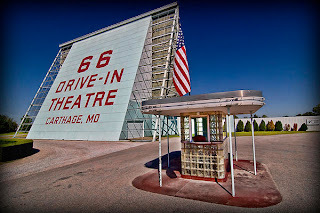 Note: On August 1, 2013, there will be an official Disney/Pixar endorsed screening of Cars at the 66 Drive In Theater in Carthage, Missouri, as part of the 2013 International Route 66 Festival. This is the first time that the festival will be held in Missouri and Disney is honoring the occasion by sending life size replicas of Lightning McQueen and Tow Mater. They will also be handing out Cars merchandise to children and the sheriff of Radiator Springs (Michael Wallis?) will be deputizing young Route 66 enthusiasts. In my opinion, this is perfect symmetry. Disney/Pixar was inspired by Route 66 to make Cars, a movie that brought them tremendous international success. Now Disney/Pixar is using their influence to promote the road that gave them that inspiration. It’s one of those special occasions when a movie can influence and build up the community around it. It’s not the finish line, but it’s a step in the right direction. Thanks so much for this post. I've written on this site before of my love for Cars. People, please don't judge it by its horrible sellout sequel! The sequel is definitely disappointing, isn't it? I mean, as far as animated kid's fare, it's not the worst and there's still a spark to it. I love the London race at the end, because you can actually see real places. I was able to pinpoint a spot by the Tower of London where I actually stood and took a picture. So clearly time and energy was spent on paying respect to that landscape, just like in America. But the first movie definitely had a lot of love, heart, and integrity to what it was trying to say and do. Then here comes a sequel that seems to have 90 percent less of those things. You're right, and I was getting it confused with the location of the Ku Ku Burger in Miami, OK. I ate at both places, but confused the locations in my writing. Thanks for the correction. Good to see someone else with a connection to these places. Wow! I simply loved the illustration. The tow truck vancouver is very responsive and responsibly does its towing service. With the changing times and increasing competition, the emergence of advanced technologies is paving the way for more and more complicated vehicles.